Find us on Houzz! 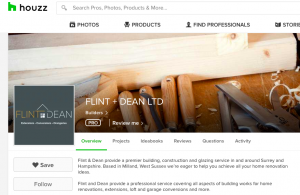 - Flint and Dean Ltd.
Houzz is a website and online community about architecture, interior design, decorating and landscape design. You can browse through millions of photos providing ideas and inspiration for all aspects of home improvement. Houzz also has a directory of professionals – from architects and interior designers to furniture suppliers and builders, which is where you’ll find us! We have created our own professional profile to showcase our work and have a place to exchange ideas with clients. Ideabooks on Houzz works like Pinterest, an online pin board for reference images. Clients and colleagues can also leave reviews of the work we have done.